The powerful current coursing through the veins of ITER's most powerful magnet systems will be carried along thousands of individual pathways known as strands. 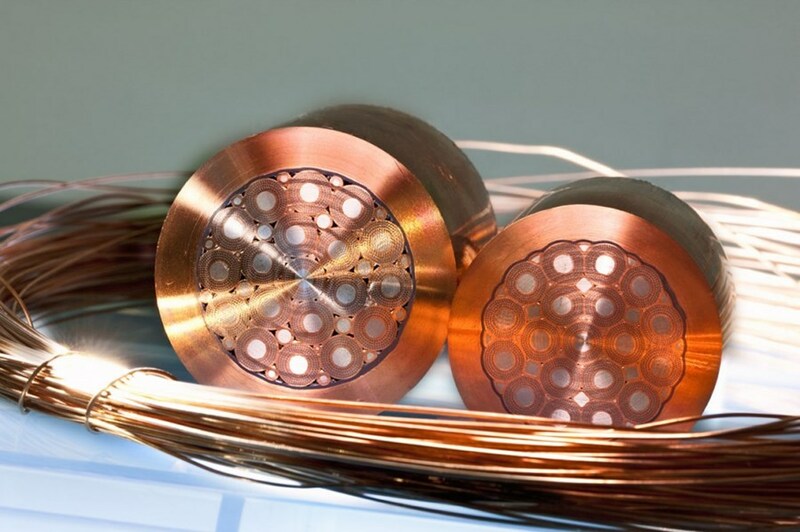 Made up of a very precise combination of elements, these superconducting strands measure from 0.73 mm-0.83 mm in diameter, and constitute the essential building materials for ITER's high-performance magnet conductors. 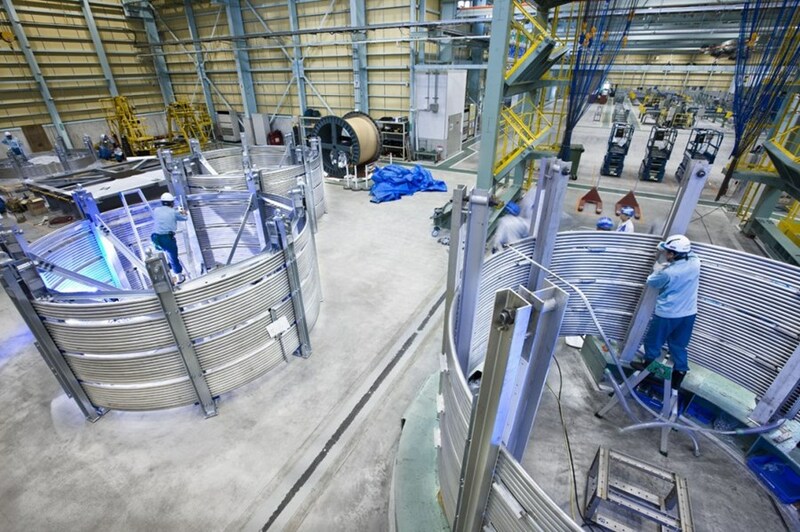 For two of ITER's magnet systems—the toroidal field coils and the central solenoid—the superconducting strands will be made of niobium-tin (Nb3Sn) alloy. 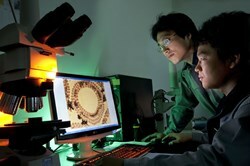 Nb3Sn is one of an array of advanced materials capable of superconductivity under high magnetic field. Its performance characteristics and relative market maturity—suppliers capable of producing long lengths of strand now exist—make it the best choice for ITER's high-field magnets. Nb3Sn is a challenging material to manufacture, however. Once niobium and tin are reacted together to form the alloy, the material becomes as brittle as glass. For ITER's purposes, manufacturers are obliged to work with the materials in their precursor state—one still separate from the other—until the magnet conductor is wound into its final position. Only then is the heat treatment that will diffuse tin into niobium applied. The manufacture of ITER's fine strands begins with a 40-100 kg metal billet, or cylinder, that contains niobium filaments, a copper matrix and a tin source—typically bronze (copper-tin) or pure tin. The precise design and composition of the billets—and the performance of the resulting strands—were carefully documented through a joint program of research and development involving the six ITER Members that will be procuring Nb3Sn strand for the project. During trials, approximately 0.1 tonne of advanced Nb3Sn strands were produced by each supplier to demonstrate production capacity. Each manufacturer will pick the design of its billet, and draw it down to strands of less than one millimetre in diameter and 10-30 kilometres in length. 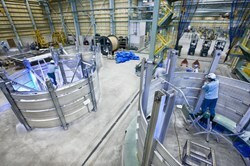 Some strand from every billet will undergo tests to assure that ITER's performance metrics are met. The detailed test results of every strand piece and billet will be stored in ITER's Conductor Database. A length of superconducting cable is made up of both Nb3Sn strands (900 for the toroidal field coils and 576 for the central solenoid coils) and pure copper strands. The copper strands are included in the mix to provide protection in the case of a quench—a situation where superconductivity is lost due to a local temperature rise in the magnets, and the electric current needs supplementary pathways to travel along. Six of the seven ITER Members will contract with their industries for the manufacture of the tens of thousands of kilometres of Nb3Sn strand required for the toroidal field magnet system (380 tonnes) and central solenoid system (122 tonnes). The first 50 kilos of Nb3Sn strand was produced in December 2008 by the Japanese manufacturer Jastec. Since then, two suppliers in Japan have produced more than 50 tonnes of Nb3Sn strand. Production has now also begun in Korea, the Russian Federation and the United States, and pre-production in China and Europe. By 2011, worldwide capacity will have expanded five-fold thanks to the requirements of ITER. Thanks to Matt Jewell, ITER-Monaco Postdoctoral Fellow in the Magnet Division, for his contribution to this article.